Are you comfortable saying that the Logos took on flesh as His own and perfectly subsisted in it without mention of Him being converted to be flesh? This discussion is fascinating and I'm hesitant to break the flow, so please feel free to ignore this. But I'm looking at all of these pictures people have posted and this question of whether or not Jews had icons, whether an icon of Christ is an image of the Father ... what I'd like to know is, what is the difference between a picture and an icon? I know icons are made in a special way, blessed (is that right?) and venerated in a special way. And they are meant to conform to particular representational rules, aren't they? But still ... at what point does an icon take on something that differentiates it from a religious picture? Also, if you read the book, "The Bible, Protestantism, and the rise of natural science" then you will see some of the connections of why the modern age in the west is mostly Atheistic. This will also help you understand why the ancient world saw things(nature) differently. Just as the ancients had a 3 or 4 tier system of Biblical interpretation, they also had a multi-layered interpretation in regards to nature as well. what is the difference between a picture and an icon? In Greek, there is no difference. The word for icon is "Εικονα" ("eikona", pronounced "Ee-ko-nah") and means simply "image". A painting or photograph of a tree is an "eikona" (image) of a tree. In Greek, there is no difference. The word for icon is "Εικονα" (Ee-ko-na) and means simply "image". This explanation is incomplete and not very useful, as it does not allow for context. Taking the word icon as used in modern English, does this mean that a computer icon is an image worthy of veneration? Of course not. Thanks, Jnorm. I'll try to get to that book but, obviously, if I were to do this properly I'd need to spend a year or so reading not just that book, but lots of others - something I should do, but maybe not yet! I'm familiar with interpretation in the 4 types, but I don't understand exactly how this explains icons? I'm disappointed with your post, ozgeorge. You seem have misunderstood what I wrote. Or chose to do so. A religious picture can portray how someone sees a certain scene or person, the icon shows how the Church sees the scene or person. But pictures aren't just quasi-photographic records, are they? That's a very small slice out of art history. The icon has a symbolic component in it (e.g. the halo) that has to be conveyed. It's the reason why a photograph of say, St. Tikhon, is not an icon of St. Tikhon. St. John is shown with wings (since he is greater than any man born of a woman, with the obvious exception) although no one believes he had them. In Greek "messenger" is "aggelos" (Angel). Just to ask: what exactly does the Cherubim look like in Jewish temples? I'm not sure anyone knows exactly what the cherubim looked like in the Temple. Of course pictures and religious paintings can contain symbolism. Anyone who's taken an "Intro to Art" class will agree with you on that point. So what makes an icon an icon, and not just another religious painting? The first thing would be that the iconographer (the person "writing" the icon) is following the canons established by the VII Ecumenical Council. This includes the two-dimensional style figures, and that no shadows are included in the icon. (An icon is to give off light, not receive light.) Another element to iconography is that the icon is not to be a reflection of the iconographer's personal ego or "style" but is to be consistant with the icons painted before him. Now while it is true that each iconographer will have his own little twist on things (after all, we are human) it's not to be immediately apparant. For example, when one sees a painting by Caravaggio, one immediately knows "Oh, that's a painting by Caravaggio, and not Michelangelo." With iconography, it's not about the artist -- it's about the subject matter. One is focused on what is being potrayed, not who is potraying it. I hope this helps clarify some things. Do you know? Do any of your Rabbis know? Does your tradition say anything? But surely, there is/are Cherubim right? And those Cherubim were not regarded as idols most certainly. What we know about them comes from Exodus 24:18-22 and Exodus 25:40 (LXX). There were two carved statues of cherubim on the lid of the Ark of the Covenant which faced each other and their wings stretched towards each other. So we know that they had faces and wings. There were also ten curtains which hung at the entrance of the Holy of Holies, and each curtain had a cherubim on it. Were they subject to veneration? Does the Talmud or "Jewish Fathers" say anything? The Ark of the Covenant and its contents was the most holy object in the Temple and the Holy of Holies where it sat was the most sacred place on Earth. 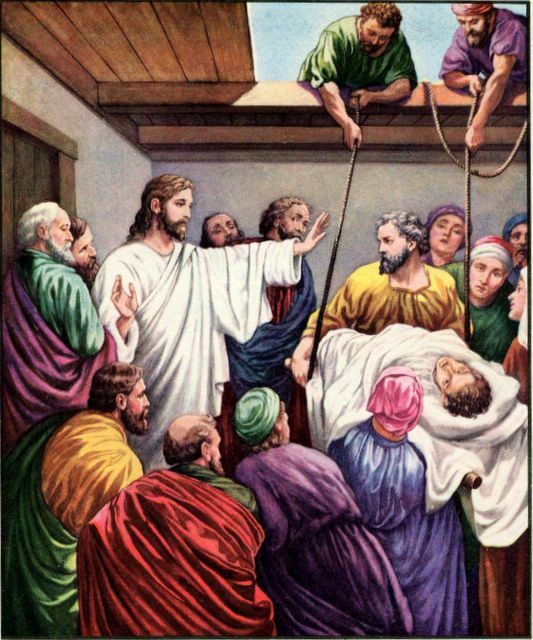 Wasn't that the place where only one guy in the entire world could go in, and they tied a rope to him in case he died inside, so they could pull him out? That must have been some heavy duty venerating! LOL! Thats right. Only the High Priest could enter the Holy of Holies and only on one day of the year (Yom Kippur- The Day of Atonement). I didn't know about the rope thing! Actually, after looking around the net for info on it, the rope things appears to just be a legend. Yes Exodus 30:10, Leviticus 23:27-32, Leviticus 25:9, Numbers 29:7-11, Leviticus 16:1-34 . Although bells were attached to the priest, there is no verse in the Bible that says a rope was tied to his foot. I'm not sure if the "rope theory" is oral tradition or a biblical assumption. Sorry. I didn't realize you were asking about the rope yochanan, I thought you were asking whether the High Priest was the only one alowed to enter the Holy of Holies. No problem. Hey, where did you get the idea of the rope? Can you give me a link? It would surely support icon-veneration. Its a very strong argument because its from the OT: a direct command from the LORD. Ah, should have know to ask you first off! But, I work with medieval Books of Hours. I think the pictures aren't always considered to be icons, exactly - especially those that show non-Biblical, traditional scenes. And the illuminators don't usually sign their work, nor can you easily tell which pictures are by whom. You certainly can't look and say, 'Oh, yes, that's the Master of the Douai Psalter' - you can make a guess, but I suspect it's as easy as telling what was by Rublev and what wasn't. So why aren't these pictures icons? Or are they? Btw - Maureen, you won't have seen this since it was in the UK, but did anyone else catch the documentary series on the art of Russia over Christmas? Maureen, these are not Canons of the Seventh Ecumenical Council. Usually what we refer to in Orthodoxy is in relation to Byzantine Iconography and it's child, Russian/Slavic Iconography. I know that within Western Rite Orthodoxy they do use statues, and have a more Western look to their religious artwork. As I'm still in Atlanta I don't have my books on iconography with me, but I can check into it when I get back to NJ. We have examples of realistic art from the same time of ancient icons, but the Church chose iconography instead of such art. So it is a much larger slice. The whole pie actually. In religious art the artist expresses his own personal faith. The iconographer has conventions he must attend to, because he expresses the Faith of the Church. The are, of course, photographs that are said to be "iconic." They still only portray the visible spectrum: iconic quality is envoked, rather than portrayed. Thanks, Maureen. I think this is one of these things I just need to spend plenty of time thinking about. I don't 'get' icons on some level that isn't really to do with theology, and maybe I'm asking the wrong questions when I ask what is/isn't an icon. Mind you, I wish I could understand it better, then I'd understand my own thesis a whole lot more! Sorry, I didn't express myself clearly. I meant, there's plenty of art that is non-realistic, whilst also being non-iconic. Is anything that expresses religious faith in a symbolic matter an icon? What pictures were you thinking of when you said that artists express their own personal faith in religious art? Btw, I love the idea that the 'iconic quality is evoked, rather than portrayed'. That makes a lot of sense. At its most fundamental there is nothing that differentiates an 'icon' from a religious picture. What differentiates a 'Holy Icon' from a computer icon (in English) or an eikona/image of Christ from an eikona/image of a tree in Greek is the subject matter. The underlying principal is that the respect (or disrepect) shown to an image transfers to the subject of the image. So if I throw darts at an image of the President (whether that's a photograph or a somewhat abstracted sketch), I'm showing disrespect to the President. If I show honor to an image of Christ (whether its an semi-classical catacomb image, a 10th-century Byzantine 'icon', or a Baroque painting), I am showing honor to Christ. Over its centuries of usage of 'religious pictures', the Orthodox Church has developed clear guidelines (or even rules) for the best or proper way to depict holy things, just as we have clear guidelines for what, for example, a church building should be. But a rented storefront with a small number of mass-produced icon prints nailed to the walls can still be a *real* temple, even if it is not close to the ideal you see in a Church custom-built to Orthodox standards with every internal surface hand-painted with traditional iconography. In the same way, an icon painted with specific imagery, in a specific style, and painted in a specific way is considered more proper (effective, etc) than said Baroque oil painting. But they are both images of the Holy which is the key issue. So we are not looking at the original Mandylion, which in any case would be a relic, and venerated on that basis. As to the resemblance to a photograph, the sources state that Abgar's artists could not made a portrait of Christ, i.e. couldn't take the photograph. And the name Malachi (whom the Evangelists are quoting: the only thing I miss about the Protestant canon is how the OT ends on that note, and picks up a few pages later in Matthew) means "my messenger/angel." That of course is true, and part of the Forerunner's exalted status. Sergei Bulgakov, The Orthodox Church. The "historicity" of this became an issue in the Nikonian "reforms"
Btw, portrayals in icon of St. John holding his severed head show that time, as well as space, is relative in iconography. Yes, it's a Jewish tradition. No, that wouldn't qualify as iconography, except political iconography perhaps. Do you mean, do other religions have their iconography? Yes. I suspect all do, but I won't say that dogmatically, but having seen Buddhist, Hindu, etc. iconography, I know others exist. Perhaps the Cistine Chapel, but then there's the problem that Michelangelo included his personal vendettas in that as well. (I hope that link works ok). As images of the holy, those would be icons in the 'Holy Icons' sense. Oh, its actually Asteriktos. Haha. Hey, Asteriktos, where did you get the idea that they used the rope. Any texts about it? Thanks in advance. That was my mistake This search at Google brings up a lot of relevant pages.